In the spirit of International Coaching Week, I am offering 10 hours of leadership coaching (for free) to a leader in need. Since “96 percent* of clients report they would use coaching again to achieve personal and professional life goals such as work-life balance, increased self-esteem, productivity and much more“, this is an opportunity for you to try a coach. In honor of annual International Coaching Week (ICW), Feb. 7-13, ICF Chapters and coaches everywhere will take time to recognize professional coaching and what it offers by hosting various coaching events within their local communities. This includes pro-bono coaching services, such as free coaching sessions, educational lectures and workshops for the public. I am donating 10 x 1-hour sessions to one leader in need to help you achieve your goal. The sessions will take place over the phone (skype) at the rate of 1 session per week. You have until Saturday February 13th to submit your profile and I will select the coachee on February 15th. I am confident you will enjoy the experience. *2009 ICF Global Coaching Client Study. 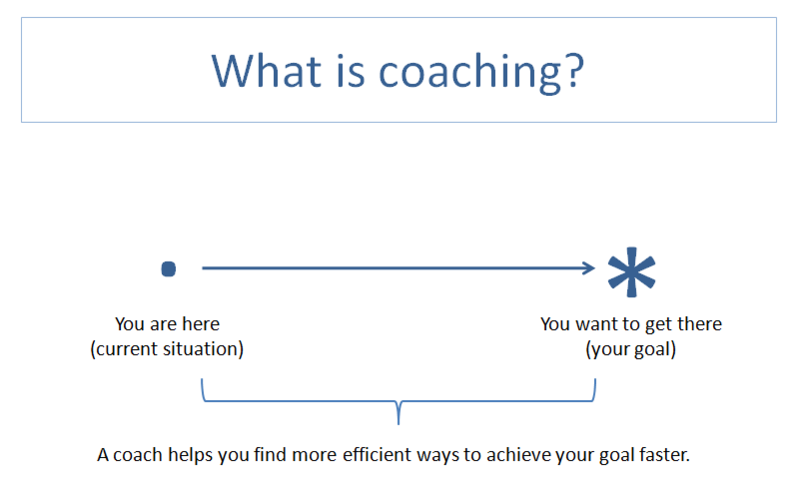 As we offer various services to help organizations transition from a traditional software development approach to a more Agile approach, we are often asked why use coaching? Assuming you are also asked the same question, you may find this short blog post useful to help you properly answer the questions. Coaching is a method of directing, instructing and training a person or group of people, with the aim to achieve some goal or develop specific skills. There are many ways to coach, types of coaching and methods to coaching. Sessions are typically one-on-one either in-person or over the telephone. – via Coaching – Wikipedia, the free encyclopedia. The ICF defines coaching as partnering with clients in a thought-provoking and creative process that inspires them to maximize their personal and professional potential. – via International Coach Federation. coachee [ˌkəʊtʃˈiː] – n (Business / Industrial Relations & HR Terms) a person who receives training from a coach, esp in business or office practice. – via coachee – definition of coachee by the Free Online Dictionary, Thesaurus and Encyclopedia. A coach sees the best in you and for you and will help you develop your skills. A coach will support you in your personal and professional growth – and will help you to live the life you truly want. You will get in touch with your values and your vision and help you discover areas and opportunities you didn’t see before. via Why use a coach? – ICF Nordic. A coach helps his coachee reach his goals faster and more efficiently than he would by himself. The coach helps his coachee define clear, realistic, and time-bound objectives applicable to his and develops a partnership to you achieve the coachee’s goal. Proposes potential alternatives to push the coachee outside his comfort zone. Coaching is an empirical process (inspect and adapt). The coaching process helps the coachee envisions himself in the future, making it easier to expect and the achieve the set goals. The coach helps the coachee see opportunities that the individual wouldn’t see by himself and pushes the coachee to set goals his comfort zone. As each goal requires an action plan, the coach forces more frequent and more productive sessions during which the progress is evaluated. Overall, coaching is a partnership process between the coachee and his coach. Why would someone ask for a coach? Coaching is not an end in itself, it is a mean to achieve a set goal. When there is a true willingness for change, the coachee doesn’t want the status quo and is receptive to being challenged in order to achieve its goal, asking a coach for help will allow the coachee to carry out their goal faster and more efficiently. What am I really looking for in my professional life? What really attracts me in my professional life? What do I really want to change? What would really spark my passion? What problems would I like to resolve to become happier or more productive? As the first of a series of posts on the topic of coaching, it is important to set the stage which is what I intended to do. Over the next weeks, I will add material to this topic and hopefully will start a conversation with you. After contemplating the idea for almost 2 years and acting as a coach for the last year, I have finally decided to sign up for a formal coach training leading to the ICF certification. Once the decision was made, choosing the trainer was the next challenge. After googling and comparing, I asked a few people around for some references. It turns out, 2 Accredited Coach Training Programs kept coming up: Coaching de gestion and Mozaik Quebec. The program relies less on formal classes and more on self-training. Instead of 27 days of training and classes, the program I selected provides 18 days of training and classes but compensates with over 2,500 pages of reading material. Based on my schedule and personal life, the latter program is better suited to my learning style. The certification program is spread over 12 calendar months (instead of 9 months for Mozaik) which will allow me more time to try and practice my new learning in between training sessions. Since there are less formal classes, the total cost of the training is about 30% less which is nothing to scuff. The program starts on January 29th. I will share my thoughts and learning along the way.